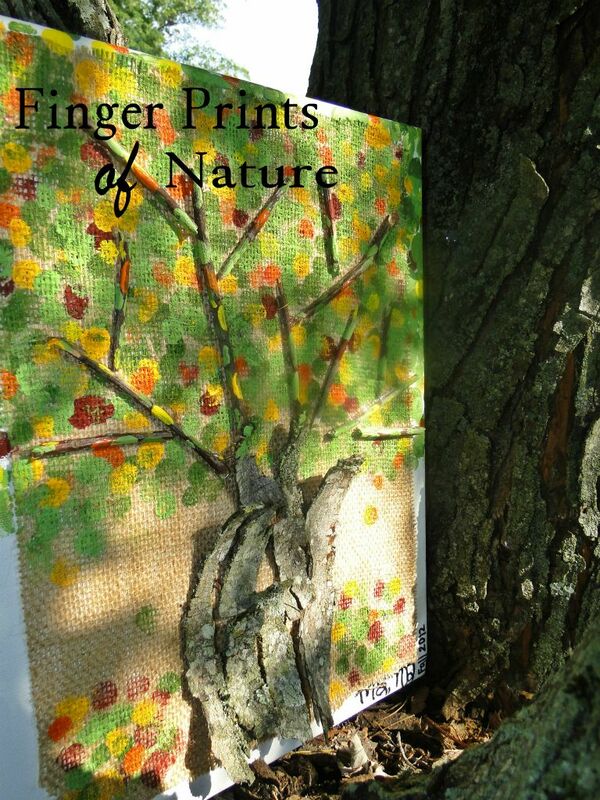 This is the story of my newest creation - a tree made by fingerpainting! I started with a plain ol' blank white canvas (I really love canvas). I put something else I really love on it too - burlap. I cut the burlap-sackcloth in a rectangle slightly smaller than my canvas so that some of the white would show around the edges. I then hot glued it down. Be sure to use plenty of hot glue to keep it on, but not so much that it weighs it down too much. Once the burlap was glued down, I went a'huntin' outside. I first began looking only for sticks, but during my search I decided to use tree bark as the trunk of my tree (you know, since that's what God used and all). So I gathered bark and sticks. After I selected my outdoor supplies, I placed them on top of the burlap to see how I wanted them arranged. Turns out, I placed them just like I wanted them on the first try! I placed my sticks where I wanted them to be for the branches of the tree (I had to break many of the sticks into smaller, more practically-sized pieces). I then glued all this down. Now, you want to be careful on this step how much hot glue you use, because the bark and sticks can really weigh it down. So don't use too much glue (you don't really need a whole lot anyway). After this was finished, it was time to get my hands dirty being a kid again! I selected the colors that I wanted to use for my leaves. I wanted a fall tree, you know the way things will look here in a few weeks when the leaves really get to changing, but still with lots of green. So I selected 2 shades of green, 2 shades of yellow/gold, 2 shades of red/maroon (although one bottle was veeery empty! ), and orange. I only purchased one of the green paints..I used what I already had for all the rest. Since my canvas is fairly small, it did not require a great deal of paint to accomplish my task. I poured the greens out on my styrofoam plate and got to work! I dabbed each fingertip of my right hand into the paint, so that my leaves would be varying sizes. 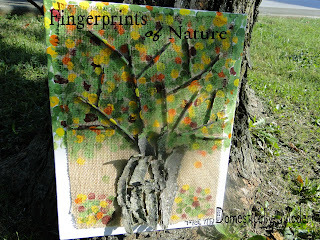 I only used my fingertips, but you could use your whole fingerprint if you like! After I fingerpainted a good bit of green, I added in some other colors, like red and yellow. Then I repeated the greens again, so that the green was the most prominent of all the colors (I wanted it to look like there were only traces of fall beginning). I added the orange and other shades of yellow and red, then repeated again with my greens. I continued this pattern (ok, it was more randomized than patterned) until I had very little burlap showing on the area where I wanted leaves. 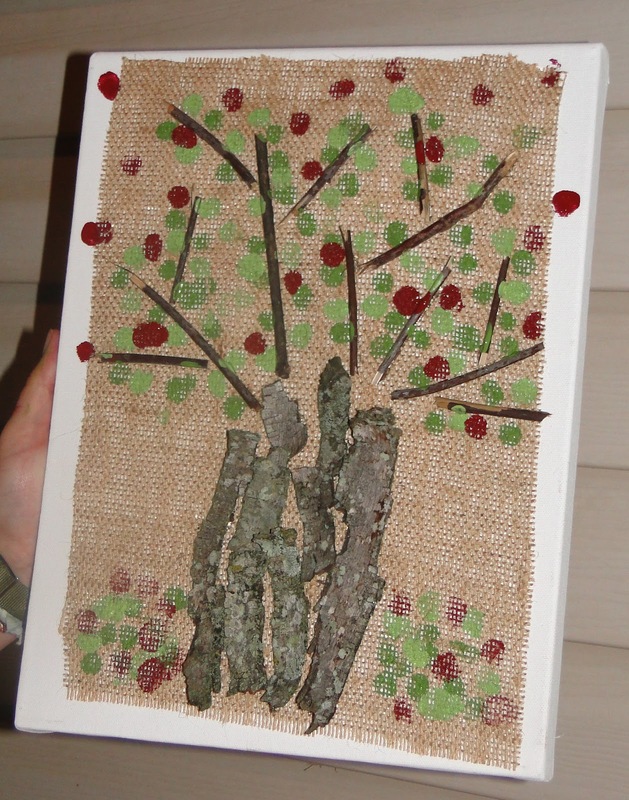 I let the leaves of the tree hang over the burlap and onto the canvas, one, because trees can become invasive, and two, because Nikki suggested it. :) Good teamwork! I realized that the more "layers" I created by dabbing colors on top of other colors, the more full my tree appeared, which is what I really wanted. I also put just a couple of leaves falling and a pile of leaves on the "ground" below my tree. After awhile, my tree was complete! I was satisfied with its color and fullness. So I took my scissors and cut off the very bottom of the burlap. This gave me a little more white space to sign our initials onto the canvas! Yay, it's finally complete! Then of course, I let it dry. -You can use paint for the trunk and branches if you don't like the use of nature but like the idea of the design. I first planned to do all paint then realized it would be cool to make it 3-dimensional and more fun..more like me! -You can make your tree be in whatever season you desire. Or, you could make one for every season! They could be interchanged throughout the year or placed together in a broken rectangle on your wall - whatever you like! -You can make your tree as full or as naked as you like. As I said, layering the colors gives it a more full effect (as does repeating the same colors after using others in between). 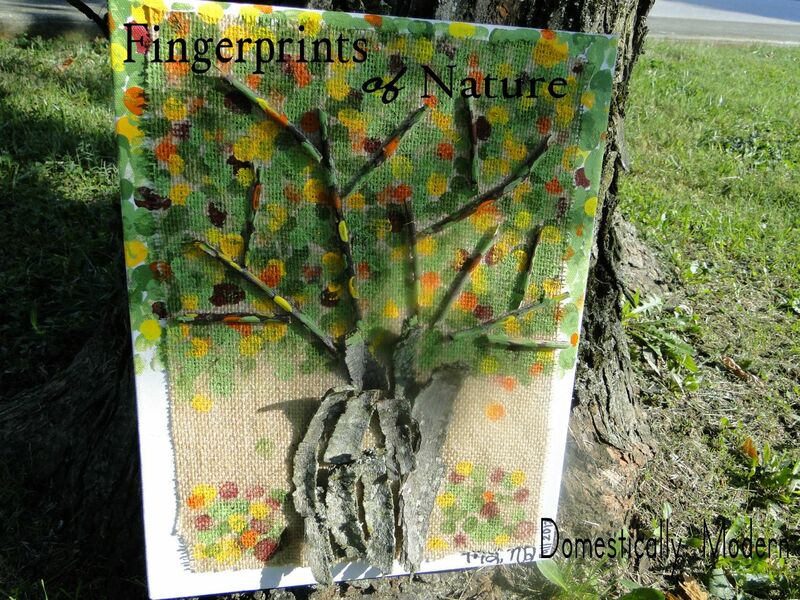 If you want to make a winter tree that is naked, you can use a lot fewer fingerprints! -This project can be really great for children, too! (You might want to help them with the hot glue gun, or use Mod Podge or some safer, colder adhesive.) Many kids would probably enjoy the nature hunt for sticks and bark, too! -As you paint your leaves, be sure to get some paint on the sticks (branches) too. It adds a cool effect (who doesn't love polka-dotted sticks?!) and looks more realistic, because we all know leaves consume their branches! Please share with us if you decide to make your own fingerpainting tree. We would love to see what you come up with!